New crop of local apples are just coming in from California, including Galas from the Stockton area and Gravensteins from Mendocino County. Vince Gizdich is on deck with his local apples in early September. He usually starts with Galas, Red Delicious and Golden Delicious. We expect his exquisite Black Twig and Winesap heirloom apples to start in October. New crop of California pears (Bartlett and Bosc) are here from Lake County. We’re expecting some of our best-tasting pears to arrive from Medford, Oregon in October. Late summer is a great time for melons so get ’em while you can. We still have a good variety of organic and commercial heirloom melons that are all eating fantastic. In addition, there are great heirloom tomatoes from Chiala Farms in Morgan Hill. We also have organic Beefsteaks from Phil Foster in Hollister. And we can’t fail to mention all the specialty cherry tomatoes, including sweet 100s, mix medleys, sungold mini and charm) coming south of Santa Maria. Our stone fruit is still good. 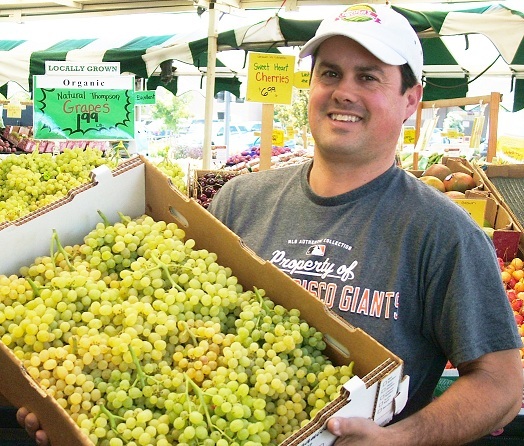 We’re getting some phenomenal fruit from Andy Mariani in Morgan hill as well as some mountain fruit from Placerville. The shift is on from Fresno to Washington on the stone fruit. Cherries are coming out of Canada and are supposed to make it until September.